To Cite: Seraj B, Tosifian M, Ghadimi S, Kharrazifard M J. Measurement of Deciduous Teeth Size in Selected Sample of Iranian Population, Iran J Ortho. 2015 ; 10(1):e4979. doi: 10.17795/ijo-4979. Background: Tooth size is an important factor that affects alignment of the teeth in the dental arch and occlusion development during dentition transition. Objectives: This study was carried out to measure mesiodistal dimensions of primary teeth to provide standard for the tooth size. Knowledge of such a standard of tooth size is significant for a better analysis of the space and more appropriate planning of orthodontic treatments. Patients and Methods: The current study was conducted on 32 children, aged 5.5 - 6.5 years, in late primary dentition. The dental casts were prepared and the tooth size was measured by a digital caliper. The obtained data were analyzed by ANOVA and t-test. 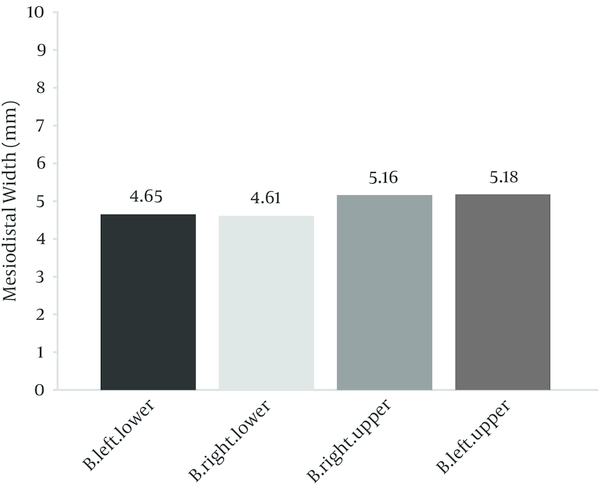 Results: The mesiodistal width of primary central incisor in the upper left quadrant was larger than those of the rest of quadrants. Also, the mesiodistal widths of primary lateral incisors in the upper left quadrant, primary canines in the upper left quadrant, primary fist molars in the lower right quadrant and primary second molars in the lower left quadrant were larger than those of the other quadrants. Moreover, it was concluded that the mesiodistal diameter of permanent central incisors could be obtained according to the primary central incisors using the formula: 1.12 × (Deciduous central incisor width) + 1.27 = (Permanent central incisor width). Conclusions: The findings of this study can be used as a base and standard for the measurement of primary dentition in Iranian children. Also, measurement of mesiodistal width of deciduous central incisors can be used to predict the mesiodistal width of permanent central incisors. The data obtained from odontometric studies in many regions are worthwhile. Odontometry has long been used as a tool in anthropological studies (1). Apparently partial differences in dental characteristics such as eruption, form and size of the teeth in different populations have been significant and interesting for both dentists and anthropologists. These differences not only indicate the dental development but also dental variations, which have to be considered during the dental care of the patients (2). The mesiodistalwidth of the teeth is a major factor that influences their alignment in dental arch and occlusion development during dentition transition (3). The studies conducted on the tooth size among other populations have shown no association between the variation of tooth size and gender. Generally, the size of anterior teeth is more varied than that of posterior teeth (4). The mesiodistal width of deciduous teeth and occlusion in primary dentition plays an important role in determination of the space and occlusion in permanent dentition. The mesiodistal width of the teeth is a significant factor involved in the development of dental arch and relationship of the arches with one another. For the teeth to have an appropriate alignment in dental arch, the total mesiodistal width of all the teeth should be proportional to the dental arch associated with it. Tooth size is largely dependent upon heredity. The hereditary factors that determine the size of the teeth and arches have no connection with each other. Therefore, the difference between the size of the teeth and arches can lead to crowding or spacing (5). To have normal occlusion in adulthood, it is essential to evaluate the primary dentition in order to recognize and solve the occlusal problems in any stage of dental development (6). To this end, it is necessary to know the normal mesiodistal width of the teeth. Nonetheless, there is no normal data on the tooth size of Iranian children (7). Hence, the current research was aimed to measure the mesiodistal crown diameter of primary dentition to come up with a standard for the tooth size. The knowledge of such a standard is significant for better space analysis and planning of orthodontic treatments. In this study, 32 kindergarten children, 18 girls and 14 boys, aged 5.5 - 6.5 years with no eruption of permanent dentition were recruited as study sample. The inclusion criteria comprised of no loss of primary dentition, being in late primary dentition, no dental restorations or carries causing marginal ridge destruction and no loosened primary dentition. Having selected the samples, each child was given a code and his/her personal information was included in a form with a certain code. Oral examinations were performed afterwards from which impressions of the jaws were taken. Since taking the jaw impression with alginate from the kindergarten children was difficult and placing alginate tray inside the mouth and taking separate impression of the jaws required high cooperation of the children, putty (Speedex, Swiss) was used for taking the impressions. For taking impression, after mixing putty paste and activator paste, a u-shaped putty was formed and placed on the mandibular teeth. The child was told to bite the putty and keep the jaws fixed until the putty was hardened. After the putty was hardened, the impression was taken out of the mouth. The impression was analyzed in terms of the presence of bubble, accurate record of all teeth and vestibular depth. The impressions lacking the above characteristics were taken again. The impressions were disinfected with spray (Deconex, Switzerland). Their casts were then prepared with plaster type IV (ERNST, Germany) owing to more resistance against abrasion, scratch and damage. Next, the casts were carefully separated from the impressions in order not to damage the plaster. The quality of casts was evaluated and mesiodistal width of primary dentition was calculated by a digital caliper (INSIZE, USA, 0.01). Having measured the mesiodistal width, the obtained data were recorded in a separate form for each child. Each measurement was carried out in two different occasions and the mean values were calculated. The data obtained from the measurements of the casts were statistically analyzed. 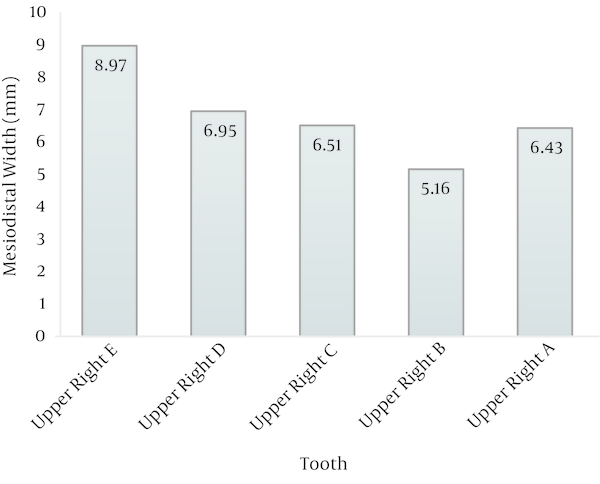 The mean mesiodistal widths (mm) of each quadrant of primary dentition are described in Table 1 and Figures 1 - 4. The maximum asymmetry was reported for primary Canines and minimum asymmetry was found for upper second molars (Table 2). Generally, it can be argued that asymmetry level in mandible was higher than that of maxilla. 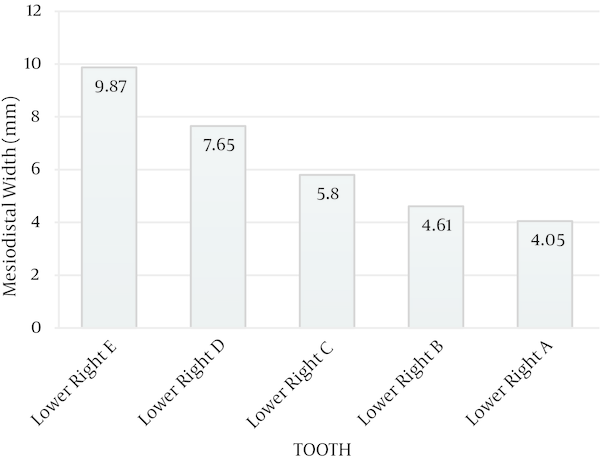 According to the results of this study, a standard was obtained for the mesiodistal width of primary dentition. 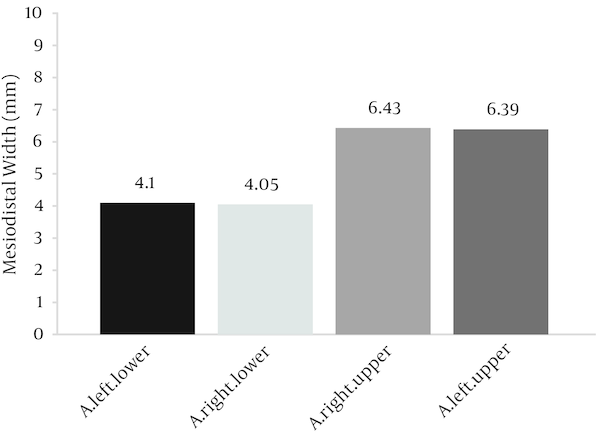 The mesiodistal width of central incisor (A) in the upper left quadrant was larger than those of the other quadrants. 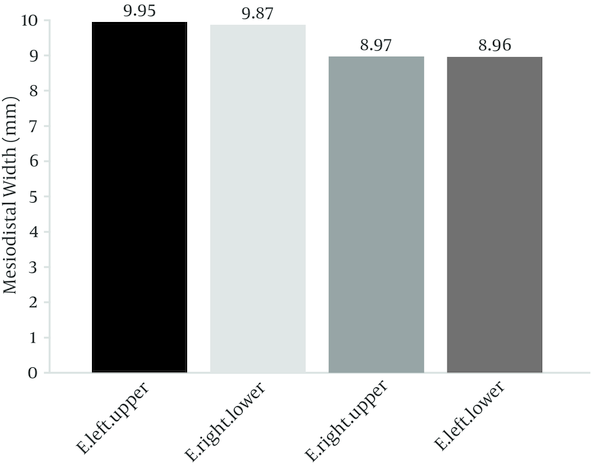 Further, the mesiodistal widths of lateral incisor (B) in the upper left quadrant, canine (C) in the upper left quadrant, first primary molar (D) in the lower right quadrant and second molar (E) in the lower left quadrant were larger than those of the other quadrants. 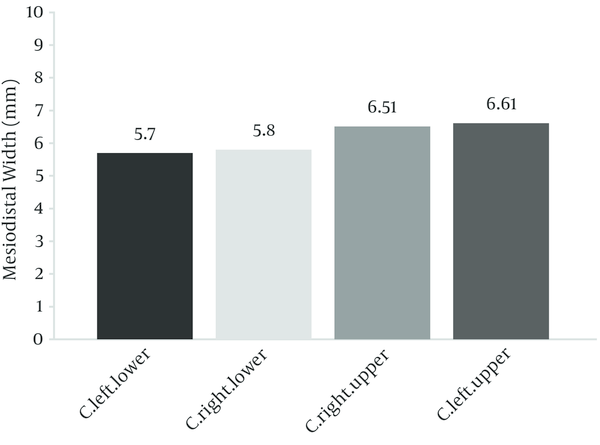 The minimum and maximum mesiodistal crown dimensions were reported for the lower right central incisor(A) and lower left second molar (E), respectively (Figures 5 - 9). 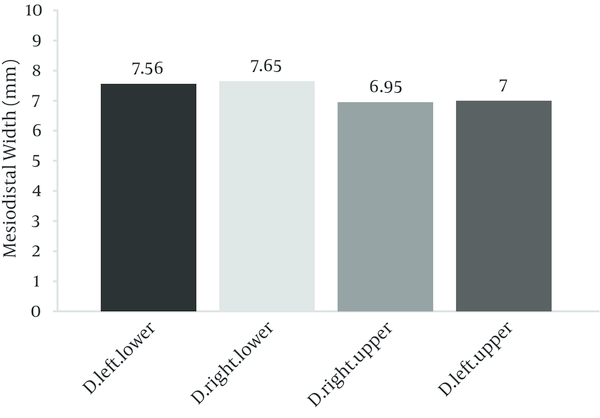 There was a significant correlation between the mesiodistal width of left permanent central incisor and left deciduous central incisor as well as right permanent central incisor and right deciduous central incisor (P < 0.05). Moreover, the correlation between the mesiodistal width of deciduous central incisor and its permanent central incisor substitute was evaluated. Ideally, the symmetrical teeth in the right and left sides should have a mirror image of each other because genetic information is the same for both sides (8, 9). The difference of mesiodistal width between the symmetrical teeth may be caused by internal or external factors (10). In their study carried out on Indonesian children, Kuswandari and Nishino (7) analyzed the mesiodistal width of primary dentition and reported a greater asymmetry between the left and right posterior teeth in males than in females and in mandible than in maxilla. The stability of mesiodistal crown width was reported to be lower in males than in females and more distinct in mandibular central incisors. In the present study, there was a higher level of asymmetry in the mandible, but unlike the results of Kuswandari and Nishino, which showed a greater asymmetry in the mandibular central incisors, the maximum difference was shown for the primary canines in the present study. Iscan et al. (1) evaluated the mesiodistal width of primary and permanent dentitions of the children in southern China. Their results indicated a significant bilateral asymmetry only for primary second molar. On the whole, posterior teeth showed smaller difference than anterior teeth; also this difference was greater in anterior teeth among Iranian children. Moreover, Iscan et al. reported the maximum level of dimorphism of primary dentition in both jaws, while upper incisors and lower canines were shown to have the minimum level of dimorphism in the given jaw. Koora et al. (5) performed a study on the children in Chennai and Hyderabad and evaluated the mesiodistal and buccolingual width of primary dentition. They reported a greater diameter of dental crowns in males than in females. In the present study, gender was not evaluated. In their study, Koora et al. showed the minimum size for maxillary lateral incisors and mandibular central incisors. In the present study too, the central incisors were shown to have the minimum mesiodistal width. 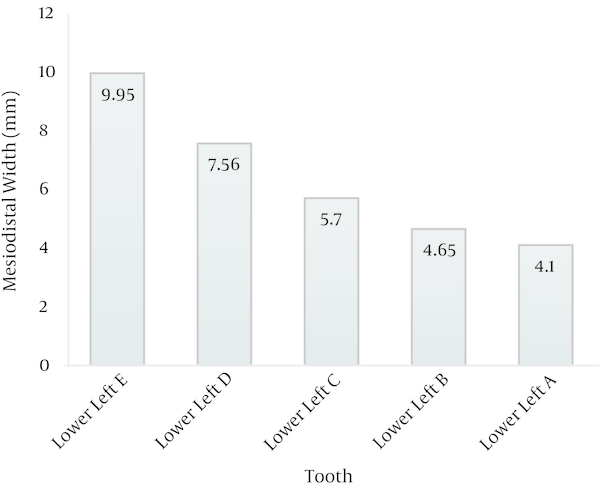 Peck and Peck (11) analyzed the correlation of crown size and alignment of mandibular incisors. They concluded that incisors cold have a good alignment in the jaw arch, with less mesiodistal width and more faciolingual width. Thus, knowledge of mesiodistal width of permanent incisors prior to their eruption can contribute to their spatial management, which is followed by an appropriate alignment and lack of crowding after their eruption. It is possible to accomplish this objective by the formula obtained in this study. In addition, the mesiodistal width of permanent central incisors prior to their eruption can be obtained according to the mesiodistal width of primary central incisors, with β = 0.5. Liu et al. 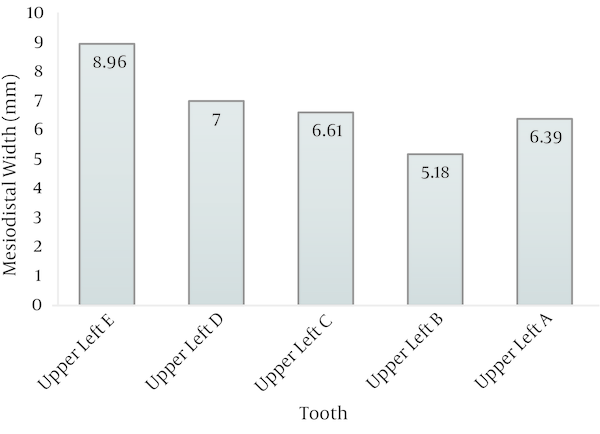 (12) measured the mesiodistal width of deciduous dentition among the Taiwanese children. They indicated a significant difference between the mesiodistal width of symmetrical deciduous incisors and maxillary symmetrical deciduous molars (P < 0.001). The maximum rate of asymmetry was shown for the mesiodistal width of primary incisors in both jaws in the current study as well. There is scarcity of information about the mesiodistal width of primary dentition in Iranian children. Hence, the findings of this study can be used as a base and standard for the measurement of primary dentition in Iranian children. Also, measurement of mesiodistal width of deciduous central incisors can be used to predict the mesiodistal width of permanent central incisors. The data obtained about primary dentition can be used in treatment plans such as space management, restorative dentistry and management of malocclusions.